Dr. Rachel O’Neill of the University of Connecticut, Mr. Hank Gruner of the Connecticut Science Center, and their colleagues have been preparing for the Genome Ambassadors public programs that will take place at the Science Center over a five-week period beginning July 7, 2014. The Genome Ambassadors programs will focus on conducting surveys and hands-on genomic- and genetics-related activities with families visiting the Science Center to gauge public awareness and understanding of the principles and concepts of the field. The information collected will be used to guide the design and development of a 2,500 square foot genomics installation that the Science Center is planning for the next few years. In preparation for the public programs, the team conducted a literature search to define the key genomic principles for public understanding, built pubic assessment activities, and established a graduate student fellowship program, which supports two Ph.D. students in their training to undertake research and outreach activities in Genomics Literacy. Local high school students, taking part in a six-week genomics program at the Science Center, will be working with a staff member to develop and test pilot genomics- and genetics-related activities for family audiences. 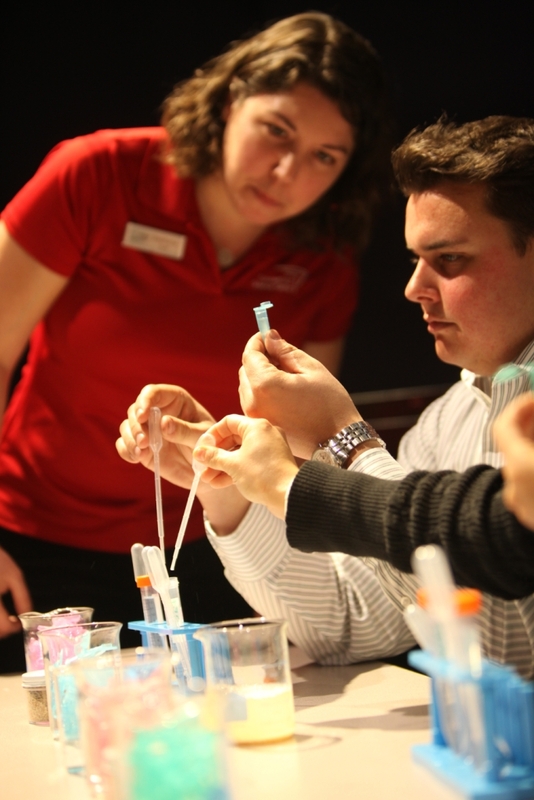 These activities, along with the public assessment work that will be done by the University of Connecticut graduate students, will be implemented in the Science Center’s Health and Sports exhibit gallery. The two groups of students will work together on the Science Center floor presenting activities to the public that embed the survey work with hands-on learning experiences. The opportunity to connect high school students with an interest in genomics-related careers with university graduate students studying genomics was too great an opportunity to miss and benefits both groups of students. Through this program, the high school students will engage with their “near peers”, get to explore career options in genomics and post-secondary education, build their confidence in working with the public, use the information gathering from the collected data to guide the development of the activities that will refined over the summer, gain content knowledge, and build a new awareness of the field of genomics. The graduate students benefit by enhancing their science communication and mentoring skills while guiding the high school students and interacting with the museum visitors.